Since this is the last week of August I had planned on sharing the recipes and review for August’s Magazine of the Month but as I mentioned a few days ago I have had computer issues. Since my computer is being repaired, which has all the photos for those recipes on it, I will have to post pone those recipes and review for a few days. But in the mean time how about a small giveaway! Cereal is my go to breakfast and snack option. I eat A LOT of cereal. And boy was I excited when I saw the new Fiber One 80 Calorie Cereal! Now I can get my cold cereal fix without any guilt! 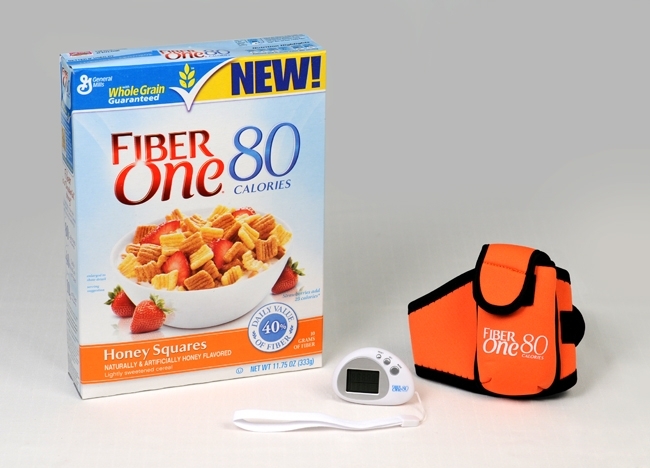 Each crunchy wheat and corn puff square in every bowl of Fiber One 80 Calories cereal has a light honey flavor. It is full of fiber, containing 40% of the daily value, which helps satisfy your hunger and helps you feel full longer. 1. Leave a comment on this post answering the following question: What is your favorite breakfast option? 2. Become a follower of Kitchen Concoctions through Google Friend Connect. 3. Tell someone about this giveaway, whether it be on a blog, Facebook or Twitter and leave a new comment letting me know and sharing the link. 4. For a fourth entry to this giveaway, head over to Kitchen Concoction’s Facebook page and click ”Like”. Then come back here and leave a separate comment letting me know you did. 5. And for a fifth and final entry follow Kitchen Concoctions on Twitter. This give-away closes Wednesday, September 7, 2011 at 11:00 PM CST. Winner will be chosen at random and will be announced sometime shortly after the give-away ends. Winner must contact Kitchen Concoctions within 72 hours at kitchen_concoctions at hotmail dot com to claim prize. If winner has not claimed prize within 72 hours then a new winner will be notified. Giveaway for US residents only. Disclaimer: Fiber One 80 Calories cereal, information, and giveaway have been provided by General Mills through MyBlogSpark. My favorite breakfast option is a breakfast taco. Personally I like Eggo Waffles with peanut butter and honey. Or vanilla yogurt with granola…. or…. guess just about anything is good! couple of nuts, m&ms and a few carrot sticks. i know not the "heatlthist" way to go – but it does get some protenin/energy in the system earlier than it might otherwise…. My favorite breakfast option is cereal! I am ashamed to say that I am not a big breakfast eater. If I do take the time to eat breakfast it is usually a protein bar or a banana and a spoonful of peanut butter. My fav breakfast is anything cereal/oatmeal related! I absolutely have to have my oatmeal in the morning! It is the only thing that will keep me going until lunch. I like Kitchen Concoctions on FB! My favorite breakfast option is sausage and gravy biscuits, but I usually just have a bowl of cold cereal with milk 🙂 *Thanks* for the giveaway!